I understand that they want to get the toys out as fast as humanly possible but I wish they'd slow down the pace. There is some good storytelling going on but they're not giving us time to process it. Minus pacing issues, this was another fine episode. Friendly competition between Kou and Towa throughout, Banba is shown to be extremely strong, and Towa learns something from Kou's team by the end of the episode, relying on awakening his Kishiryu over taking the easy way out and killing the source of the Minusaur's power. The comedy was also quite fun (especially the scene at the end!). Banba's last words to the father were "there's nothing more important than family". He obviously is a good guy at heart but his reasons for fighting are separate from the core three. We'll see how far he'll go next week as it seems Towa will be falling ill. Plus, a tease of Milneedle this episode, but the full gattai will be next week. Tigerlance looked pretty cool but the fight scene was a little underwhelming. It's still extremely bizarre to me to see this kind of conversation happening so casually between Sentai heroes, but I will begrudgingly admit this episode was alright. It's not quite great. I have some problems with how little growth Towa actually underwent here, in particular. I don't feel like he had a particularly impactful change of heart, and we still don't know much about him or Bamba other than that Koh is probably right in thinking they would murder a child for the greater good, but we get a decent feel for their personalities, and while I still violently hate Towa's smug, ambiguously sociopathic face, I did actually like Bamba here a fair bit. I'll concede I probably was being unfair last week by lumping him in with his stupid little brother. His dialogue towards the end about family is clearly meant to be meaningful setup for something or other too, so hopefully that explains some things down the line. I still don't know why we can't just have good character development right now, but this episode did restore my hope that Ryusoulger will eventually get its act together. We've got the first big showdown with the enemy commander coming up right on cue for episode 5, so I'm definitely looking forward to that. This episode was fine but I agree with everyone else, they gotta slow down the pacing. I appreciate that they arent messing around and "wasting" time but development is going by too quick. First Ui's and now Towa's. Towa has known the core 3 RyuSoulgers for 1 episode and they've already had a character changing impact on him. He knows little to nothing about them but this change happens so early and so quick cos "plot". I was just wondering, since the Minusaurs grow large by continuing to get stronger does that mean that most of the time the Ryusoulgers won't be able to beat the Minusaur on the ground? Because if they do then there wont be a giant Minusaur to fight. I have to admit I found the "two businessman exchanging cards" funny. I don't know why. I'm glad they're continuing to work on making the mecha fights dynamic. 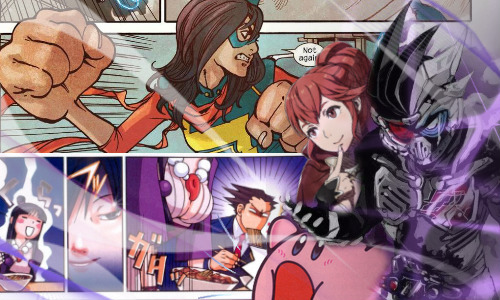 I'm trying to figure out why everything feels so rushed, given that we don't know much about the villains and we've got a standard-sized Sentai. I'm inclined to blame it on the toys, but I'm not sure that's entirely it. Yeah, we've introduced different KishiryuOh combinations in each episode (standard, standard-chompy-hand, Three Knights, and TigerLance), and they're pushing the RyuSouls pretty hard. Thank goodness they seem to have abandoned the Sou Sou SOU! 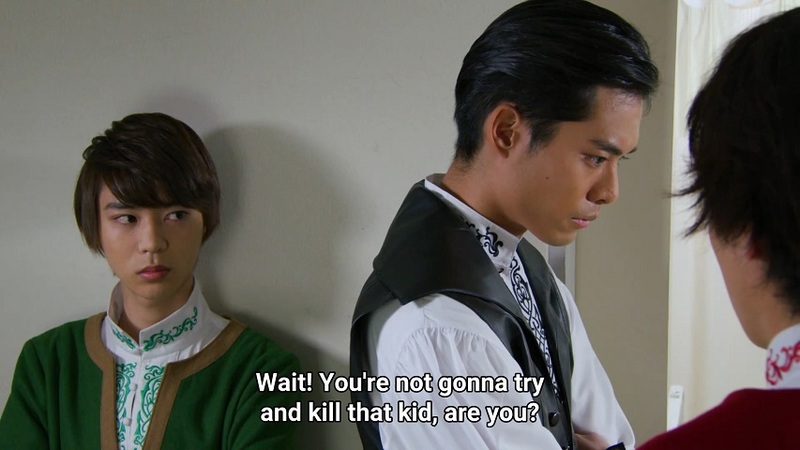 jingle when the RyuSoulKen is used. Is "rushed" even the right word? I don't feel like I know the Ryusoulgers very well so far. Asuna, Melto, and Koh feel pretty generic. Towa is memorable, but unpleasant. Banba shows promise. Ui and her uncle still feel to me like sketches rather than characters. Koh is... well, I like him more than Takaharu and Lucky, although less than Daigo and Yamato. If they were trying to reproduce what worked about Daigo, they weren't successful; he managed to come off as relentlessly positive without seeming stupid, but part of what made it work was the actor's charisma. Koh comes off as faintly gormless. I'm as baffled as several of you about the casual discussion of killing Minosaur victims. I don't expect the show to go through with it, but this episode doesn't make Towa seem much less psychotic than last week. Maybe they'll make all this pay off when one of the Ryusoulgers becomes a Minosaur host. I'm still enjoying the show, but waiting for it to feel special outside the mecha battles. Chasesinister made a good point: unless the Druidons start to operate like standard Sentai villains, we basically won't see the normal-sized Minosaurs defeated before they grow. Given the genre's love for finishers, I'm skeptical. I highly doubt it, especially since it was delayed and shortened even more by the strongest battle. Furthermore, May is, um, next month. So that would give a few more episodes?? 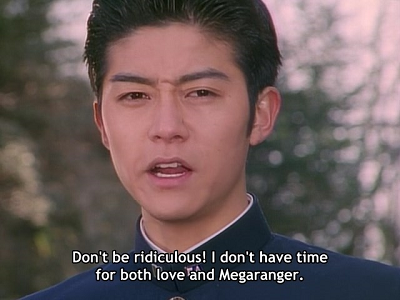 Besides, Sentai doesn't have the same big thing about eras as Rider does. And talking of Rider, half a season would mean that the toyline after Ryusoulger would debut around the same time as the toyline after Zi-O -- and we know for a fact they want to avoid that.